Charles Duhrigg has a great book: The Power of Habit that looks at the intricacies of habits, how they're formed and how to affect change in these habits. Breaking them down into their component parts, he looks at the cue, the routine and the reward. Habits are unbelievably powerful components for players to harness as they can automate a great deal of what a player performs on the field. This in turn allows players to function at a greater level while some components of their game are automated. 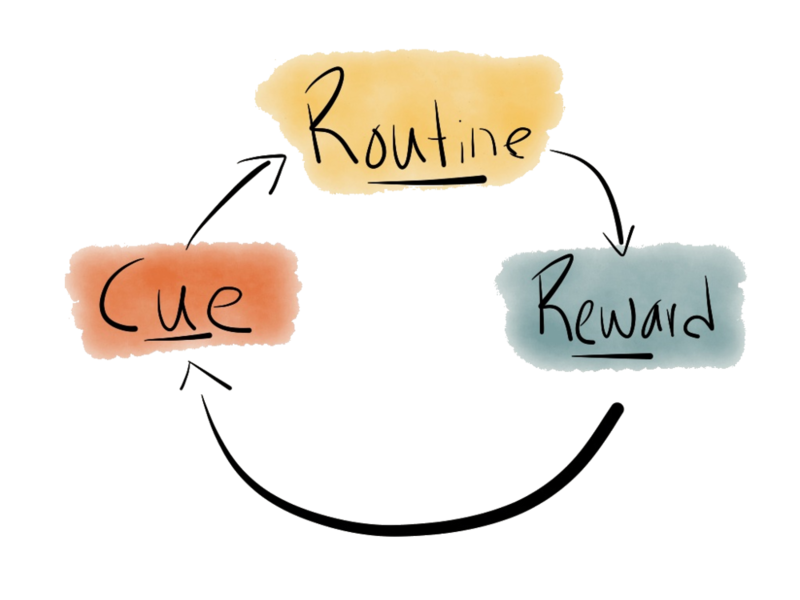 By using the habit loop, social media companies and app developers have tapped into the power of habit to keep people coming back for more. Think about Instagram for a second. You get a little notification (that's your cue to pull your phone back out), you then open the app and see what's new (the routine of checking that little red dot and perhaps scrolling through the feed) and then you get a hit of dopamine and feeling good about yourself because someone liked or commented on your picture (that's your reward, a little heart sign or a comment). The same is true of e-mail, messages, mobile games etc. They've mastered the use of the habit loop. We've all seen the volume of people addicted to their phones and these habit loops - it's powerful stuff! But the good news is, it can be harnessed and the power of the habit loop can work wonders for a soccer players' game. This is the starting point for all good habits in soccer and it's important that players are taught to recognize the cues. I'm sure you've heard coaches across many sports talk about the cues for an action. Unfortunately, this is coach speak, and typically players don't always understand what this means. A favourite adaptation that I've stolen is "what's the thing you see". It tends to simplify the meaning for the players and help them look for the cues. A good example would be the overlap. One version of the overlap is when a winger drives inside, taking the opposition full back with them: leaving space on the outside for a teammate to overlap and get around on the outside. If a fullback is taught to look for the thing they might see (the cue): of the winger ahead of them cutting inside, he/she knows that they should be on their bike to get around in support. As the red winger drives inside, that's the cue for the full back to overlap in support. Once players are able to recognize the cue (or the thing that they see on the field), they are then ready to put things into action. This might be movement off the ball (as in the overlap), the execution of a specific technique, or the beginning of some sort of combination play. In the example above, Pep's principle acts as the cue. If I'm David Silva (#8) and I find myself too deep, I know that that's my cue to either drop off even deeper in support or to rotate further forwards to try and break lines. It's this understanding of the routine: I need to adjust my position, that makes Manchester City's movement off the ball and possession look effortless. This is why the power of habits is important - there are great rewards to be had! It might be that a players understanding (the cue AND routine) of the overlap leads to more adventurous fullbacks in better crossing positions to lay on chances for the forwards (reward!). Or it could be on a grander scale that players are taught an entire framework of principles, the cues and routines in the middle of the park, that lead to a fluid centre midfield of Fernandinho, David Silva and Kevin DeBruyne. They made it look effortless this season. A lot of their rotation of positioning and possession of the ball (their reward) came from understanding what to do and where to move based on the current picture and positioning of teammates. A number of data analysts will tell you that adding set piece goals to a team's repertoire is the quickest way to score more goals and gain more points over the course of a season. A number of team's hire people for this sole purpose: set piece design. One of the more old school applications of the habit loop is still seen in many a game today. When James Ward-Prowse puts a hand up for a corner, that's the cue for his teammates. The resulting pattern of movement or trained set piece is their routine. If a chance on goal is created or a goal is scored, there is no greater reward. It's a simpler habit loop because the game slows down for it to be implemented, but it shows that the concept has been a part of the beautiful game for a long time. If we can teach players more cues and the routines we want them to associate with them, I think we can find a lot more players reaping the rewards of making those actions automatic and creating powerful habits and ultimately, more effective players.